INVESTOR PROFILE: From the police academy to a property academy, Tua Saseve’s property journey is one with a difference and now he’s teaching others how to build a successful portfolio. Once upon a time Tua Saseve’s life revolved around investigating crimes and keeping the peace. These days his focus is on teaching people how to build wealth through property. It’s not the most obvious career transition, but his journey from the police academy to a property academy has taken place in a logical and orderly fashion. Along the way, Saseve - who shares his story in this month's issue of NZ Property Investor magazine - proved his mettle as a highly effective trader, enabling him to develop two separate, successive portfolios from next to nothing. He also now runs Auckland Property Mentors, which is in Gilligan Rowe & Associate’s property division. It may all seem a world away from his days in blue, but there are similarities. While the work stories are less dramatic now as he’s no longer dealing with life threatening situations, Saseve still employs many of the skills he learnt on the force. And all he does in property is guided by a sense of duty, engrained during his days in the police, and the Samoan concept of Tautua, which means service. Property investment was not originally part of Saseve’s plans. Not long after finishing school, he went into the police and his goal was to be a career policeman. However, at the point of promotion, he realised there were other things he wanted to do so he headed back to university and that put him on the path to property investment and mentoring. Along the way he hit a major roadblock, which led to him having to sell up his first portfolio. But he quickly got back on track and started rebuilding. In his current Auckland-based portfolio, which is valued at around $2 million, he has two high-yielding properties with another property now under contract. He is also part of a private property syndicate which has holdings worth about $50 million. 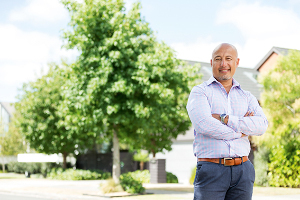 To read more about Saseve’s property journey and to get his property investing tips, click here to get the digital issue of NZ Property Investor magazine.